Newell & Shrader: "OF DUTY WELL AND FAITHFULLY DONE: A History of the Regular Army in the Civil War"
Clayton Newell and Charles Shrader's thick tome Of Duty Well and Faithfully Done is not a narrative history of the United State Regular Army in the Civil War but rather an impressively thorough encyclopedic reference to the officers, units, and staff department bureaus that contributed in no small part to Union victory. Never strong in terms of numbers on the battlefield, it was the staff departments that really shined all out of proportion to their size, managing the organization, training, arming, equipping, and supplying of a vast volunteer army. The book begins with a brief discussion of the state of the U.S. army on the eve of the Civil War, who led it and where the units were stationed inside each administrative department. From there, the authors delve into the army command structure and personnel from top to bottom. The two largest sections of the work deal with the staff departments and the regiments comprising the three major service branches (as well as the Corps of Engineers and Signal Corps -- the "fighting bureaus"). Expanding the army from roughly 16,000 pre-war officers and men to a volunteer one that reached over one million at any given time required the staff departments to expand in kind. Remarkably, the comparatively modest increase in bureau staff levels proved able to do the job. In their book, Newell and Shrader detail the mission, function, leadership, personnel, organization, and operations of the administrative departments [Adjutant General, Inspector General, Judge Advocate General, and Pay] as well as the Subsistence, Ordnance, Quartermaster, and Medical Departments. In addition to the descriptive nature of the their work, the authors also contribute analysis in the form of a "challenges and achievements" section for each. At the beginning of the war, the decision had to be made whether to expand the regular army or temporarily disband it and distribute the men as a cadre. The authors determined that the compromise position that was taken was not ideal and lengthened the war but recognized the political forces behind it. Popular writers often condemn the ordnance chiefs for their conservatism, but the authors rightly point out the importance of providing the men with proven weapons and the initial impossibility of producing the newer shoulder arms at the speed and scale required. On the medical front, Newell and Shrader praise advances made in hospital care, medical supply, and field sanitation but critically note that medical technology lagged behind destructive technology. They also criticize the Army Medical Department for not fostering close cooperation with the other staff departments and army commanders in the field. In reference to the former, I do think the authors somewhat undervalue the significance of AMD advances in surgical technique and training, as well as wound management. The second largest section, titled "Army in the Field", examines the leadership and organization of each regular infantry, cavalry, and artillery regiment. There are command and casualty tables for each branch, and capsule histories of the roles played by many of these units in select campaigns and battles are also provided (e.g. infantry at Valverde, cavalry in the Shenandoah in 1864, and artillery at Gettysburg and Shiloh). While the volume is adequately illustrated overall (especially with its large variety of tables), one might wish for more photographs and maps. But this is only a minor quibble with what should be regarded as an essential addition to all Civil War research libraries. The label comprehensive is vastly overused in the reviewing of Civil War publications, but it applies to Of Duty Well and Faithfully Done in a fashion few others can boast. Clayton Newell and Charles Shrader have created the literature's best one stop resource for the Regular Army in the Civil War. Lawrence & Lawrence: "VIOLENT ENCOUNTERS: Interviews on Western Massacres"
Typically, scholarly compilations of historical views on a variety of subjects under a common theme involve a series of essays, but the editors of Violent Encounters, Deborah and Jon Lawrence, elected instead to discuss the subject of western massacres through interviews with writers and historians. The nine topics under consideration in the book include the McComas murders, the Olive Oatman captivity case, the Mountain Meadows and Camp Grant massacres, overland trails violence (to include Sand Creek), the decimation of the California Indian population, and the wars fought between whites (government sanctioned or otherwise) and the Sioux, Cheyenne, and Shoshone tribes. The full range of violence is addressed, from individual killings to the deaths of hundreds of men, women, and children in a single attack. Another of the book's many strengths was the conscious decision by the editors to represent all major western ethnic groups, each victims and perpetrators at different times and places. The interview format employed in Violent Encounters works well for a variety of reasons. It allowed the Lawrences to tailor each discussion along similar lines of inquiry. For example, all interviewees, each a published expert on one or more western massacre or conflict, were asked to provide their own perspectives on the sources available for each subject, how the material was used/misused in the past, and what he or she considered the proper way to integrate it all into modern scholarship. The politicization of history, the character and level of frontier violence, and the persistent myths and controversies surrounding western conflicts are other examples of consistent themes. A particularly intriguing aspect of the format was the way its informality fostered the offering of less guarded thoughts and opinions. As an example, Robert Utley is warmly dismissive of the value of Dee Brown's work and highly critical of the manner in which the celebrated Little Big Horn battlefield archaeology was conducted. The chronological ordering of the interviews also allowed the editors to incorporate the answers of previous interviewees into following Q&A sessions. While differences were to be expected (e.g. the scale and character of pre-contact violence was a touchy subject for Ned Blackhawk in particular and only Jerome Greene felt comfortable defining the term "massacre"), there were many consistencies. While it was not surprising that all interviewees recognized the importance of integrating multiple viewpoints into historical narrative, each scholar was deeply skeptical of the accuracy of Indian oral history, especially the historical "memory" of modern tribe members. As another example, the often positive role played by the army in protecting tribes from citizen violence and corrupt officials is also noted by several of the writers. Though the editors are not trained historians (Deborah is an emeritus English professor and Jon a retired academic physicist), their notes, bibliography, and general quality of questions asked during their interviews suggest a deep understanding of the literature. The editors's concluding essay is a wonderful example of interpretive summation. A few errors did crop up here and there [e.g. Nathaniel Lyon was not a general at Clear Lake and, before Utley stepped in to correct them, the U.S. volunteer regiments from Colorado that instigated Sand Creek were repeatedly referred to as militia -- an importance distinction given the attempt to differentiate army and citizen behaviors], but they were minor irritants. Violent Encounters is an unusual and fascinating contribution to popular and academic investigations into the multi-ethnic violence of the nineteenth century West. From this book, general interest readers will obtain a snapshot of the current state of an important facet of western historical scholarship, while students of the Civil and Indian wars will gain methodological and historiographical insights of use for their own work. This edited collection of specialist interviews is highly recommended. 1. Acadian General Alfred Mouton and the Civil War by William Arceneaux (Center for La Studies, 1981). According to the publisher, "this revised and expanded edition also incorporates the most recent findings in Acadian and Civil War history, as well as new materials from the National Archives and various Louisiana depositories. Also included in the second edition are the muster rolls for Mouton's Eighteenth Louisiana Regiment and the Acadian general's West Point transcripts". I'll post a snapshot review when I finish it. 2. A Man And His Boat: The Civil War Career And Correspondence of Lieut. Jonathan Carter, CSN by Katherine Brash Jeter (Center for La Studies, 1996). This is a nice collection of naval primary source material for the Trans-Mississippi. Carter was involved with the construction of the CSS Missouri, a problem plagued ironclad launched at Shreveport in 1863. 1. The Great Heart of the Republic: St. Louis and the Cultural Civil War by Adam Arenson (Harvard Univ Pr, 2011). I liked Louis Gerteis's Civil War St. Louis, and, while both books appear superficially similar in their focus on society and politics, Arenson's new study takes a broader and more long term view at the importance of St. Louis to 19th century cultural change in America. 2. An Iowa Soldier Writes Home: The Civil War Letters of Union Private Daniel J. Parvin edited by Phillip A. Hubbart (Carolina Academic Pr, 2011). This book is an edited collection of 117 letters from a private in the 11th Iowa. Parvin fought first in Missouri in 1861-62 before heading to the western theater and the battlefields of Shiloh, Vicksburg, and Atlanta. Editor Phillip Hubbart bucks tradition, organizing the material thematically rather than chronologically. I am curious to see how well the method works in practice. According to Civil War in the desert Southwest expert Jerry D. Thompson, of the half dozen or so published diaries and journals from the 1861-62 Confederate invasion of New Mexico and Arizona, only Morgan Merrick's covers the summer 1861 occupation of the Mesilla Valley by John R. Baylor's 2nd Texas Mounted Rifles. His 77-page journal [originally titled "Notes And Sketches of Campaigns In New Mexico, Arizona, Texas, Louisiana, and Arkansas By A Participant Dr. M. W. Merrick From Fb. 16th 1861 To May 26th 1865 Actual Service, In the Field"] was published in 1991 by Texas Western Press under the title From Desert to Bayou: The Civil War Journal and Sketches of Morgan Wolfe Merrick . Thompson contributed an introduction and detailed notes, but perhaps From Desert to Bayou 's greatest value lies in its dozens of color reproductions of Merrick's sketches and paintings. In addition to many detailed drawings of the regional architecture, Merrick sketched maps, landscapes, camps, forts, and battle scenes. A series of portraits of Mescalero Apaches encountered by Merrick are among the more unusual images. The native New Yorker but pre-war San Antonio resident also fought in Louisiana with the 3rd Texas Cavalry (Co. E). There he continued his amateur artwork, completing several camp and battle scenes from the shores of the Mississippi and in the LaFourche District. 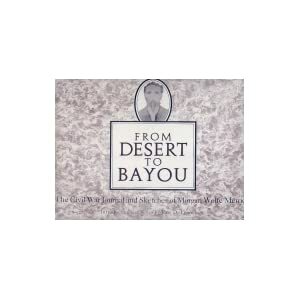 From Desert to Bayou is a very worthwhile personal and visual record of the Civil War in the Trans-Mississippi. At this time, the only history of Jo Shelby's 1863 "Great Raid" published in book form is Mark Scott's The Fifth Season (Two Trails Pub., 2001). However, Sean McLachlan's Ride Around Missouri - Shelby's Great Raid 1863 is expected to have an October release. A short work [the standard 80 pages] from Osprey's Raid series, not much more than an overview treatment can be expected. 1. Savannah, Immortal City: Volume I - Civil War Savannah by Barry Sheehy & Cindy Wallace with Vaughnette Goode-Walker (Emerald Book Co., 2011). A heavy oversize volume (first of a four volume set) bound in red cloth and full of maps, photos, and other illustrations, this glossy text and visual history of Savannah during the war is full of architecture lore interspersed with annotated historical narrative. 2. 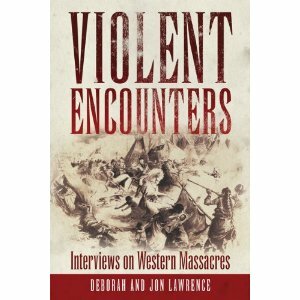 Violent Encounters: Interviews on Western Massacres by Deborah and John Lawrence (U of Okla Pr, 2011). Prominent western massacres are examined in a Q&A format with recognized experts. The two most Civil War-related cover Sand Creek and the Santee Sioux uprising. I like it a great deal so far. I'll always have a soft spot for Martin Hardwick Hall's Sibley's New Mexico Campaign (University of Texas Press, 1960). It was the first serious study I read (albeit over three decades after its release) about a campaign fought west of the Mississippi and I've been hooked ever since. Though relatively brief by today's standards, it's coverage of the desert campaign from inception through the Confederate retreat back to Texas holds up better than most 1960s campaign studies. A particularly noteworthy inclusion was a complete roster of the Confederate force. Hall, a doctoral student under T. Harry Williams, also completed a companion reference work The Confederate Army of New Mexico (Presidial Press, 1978). Tragically, he was murdered in his home in 1981, the perpetrator never found. 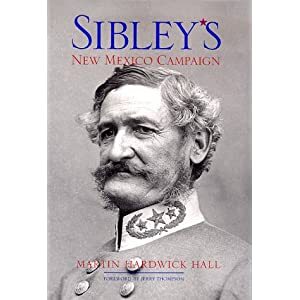 In 2000, Sibley's New Mexico Campaign was reissued by the University of New Mexico Press (with a foreword by Jerry D. Thompson). The new edition contains a number of minor corrections discovered by Hall after the original publication (and noted by Hall in Thompson's personal copy). The five maps that accompanied the first edition are absent, replaced by a single theater image. While the more recent campaign overview authored by Donald Frazier is excellent and several of the battles have received their own book length studies from capable talents like Don Alberts, it remains a worthwhile endeavor to go back and review the work of the man that started it all, Martin Hardwick Hall. Hatfield: "THE OTHER FEUD: William Anderson "Devil Anse" Hatfield in the Civil War"
Much has been published about the Hatfield-McCoy feud from the popular and academic presses, but Philip Hatfield's The Other Feud explores instead the Civil War years of William Anderson "Devil Anse" Hatfield's life. Just how much of this Civil War service information is freshly presented in the book, I'll have to leave to those familiar with the extensive Hatfield-McCoy literature. Earlier biographical works, such as The Tale of the Devil, do claim to cover the period. A slim volume of small physical dimensions and large print, The Other Feud has the modest goal of summarizing Hatfield's Civil War career as well as discussing to what degree Civil War differences fed the famous feud, a subject of some controversy. Utilizing service records and the excellent research of SE Kentucky-SW Virginia Civil War researchers Jeffrey Weaver and Randall Osborne, the author traces William A. Hatfield's association with the Virginia militia, Virginia State Line, and 45th Virginia Infantry Battalion. Making use of the O.R., books, newspapers, and manuscript material, the narrative often strays away from sustained mention of Hatfield personal involvement in events (his presence in assumed), instead summarizing the military movements and actions of the state and Confederate units. The work is most speculative in its dealing of the 1864-65 period following Devil Anse Hatfield's desertion from the 45th Virginia Battalion. His name is absent from the rolls of Bill Smith's guerrilla unit and, according to the author, no supporting documentation has been discovered. Nevertheless, author Hatfield wholeheartedly adopts the traditional view that "Devil Anse" fought with Smith. Even with the recognition that muster roll information for partisan units was necessarily spotty at best and it was often in an irregular fighter's best interest not to have his name in print, the author might have been better served to leave the details of this aspect of the Devil's life more open to debate. As for the question of the alleged Civil War origins of the feud, the text is largely inconclusive as to the depth of the role played by the great national conflict*. It does, however, persuasively argue against the popular notion that the feud had a North (McCoy) vs. South (Hatfield) character. In support of this, author Hatfield provides a pair of nice tables which list the wartime services of prominent members of the post-war feud. These appendices demonstrate no clear sectional divide. While no feuding Hatfield directly served in Union forces, relatives did, and McCoy feudists fought on both sides. Happily, the author also writes dispassionately, refreshingly avoiding the pitfalls of biographical history penned by direct or collateral descendents. On the down side, the book needs some editing work and would have benefited from a bibliography and index. A concluding chapter summarizing the author's findings would also have been helpful. In the end, The Other Feud's often presumptive assessment of William A. Hatfield's personal involvement in the war tends to raise as many questions as it attempts to answer. While in broad terms the book achieves what it sets out to do, given its limitations of length and scope, readers might best view it as a starting point for further exploration. * - The book does not cite James Prichard's excellent recent article from Virginia at War, 1863 (UP of Kentucky, 2009). Prichard takes the view that the character of the post-war Hatfield-McCoy feud was a direct consequence of Civil War mountain guerrilla warfare and offers details pertaining to Hatfield's involvement in that aspect of the war. While Philip Hatfield's work doesn't aspire to the scholarly reaches of Prichard's creation of a broader sociological context, it would have been worthwhile to address the article's conclusions. 2. Touring Virginia's and West Virginia's Civil War Sites 2nd Ed. by Clint Johnson (John F. Blair, 2011). These are state wide touring books broken down into day trip sized chunks. I've never seen the first editions of these works so an assessment of improvements made can't be made by me. 3. Battlefield Angels: Saving Lives Under Enemy Fire From Valley Forge to Afghanistan by Scott McGaugh (Osprey Publishing, 2011). This book examines the history of U.S. military medicine through theme based chapters centering on specific conflicts. The Civil War chapter looks at battlefield evacuation. Regular readers know I will rarely resist a new book about the Civil War in Missouri (at least the non-bushwhacker stuff). Recently, I learned from the trusty History-Sites messageboard for Missouri about Paul Arnold's plan to publish his thesis Badgers in the Swamps: The 1st Wisconsin Cavalry in Southeast Missouri, 1862-1863 later on this year. Beyond a few journal articles, there's not much in the way of good material published about the war in this region during this time period. I'm looking forward to it. Novelist-history writer Winston Groom is taking on another great western battle with Shiloh, 1862: The First Great and Terrible Battle of the Civil War (National Geographic, Mar 2012). If the early details are correct, it's a big one at over 500 pages. I haven't read any of his Civil War books, and a quick thumb through his Vicksburg book didn't induce me to try, so I'll probably wait for Cozzens. Presumably, Peter will try to get his out for the 150th as well, but I have no idea. 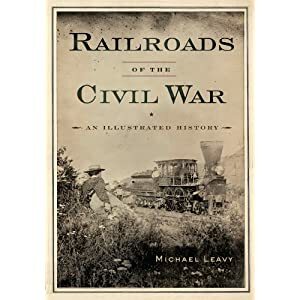 "Railroads of the Civil War: An Illustrated History"
The logistical, strategic, operational, and tactical (in the form of armored trains and rail guns) military uses of railroads are not exactly neglected subjects by Civil War publishers. While it is true that the narrative covering these important facets of rail history in Michael Leavy's Railroads of the Civil War: An Illustrated History (Westholme, 2010) is familiar and largely of generalist appeal, where Leavy's work truly shines is in his deft selection of accompanying images, many of which have never been published before. The photographic reproductions in the book are clear and large in size. Photos and text are organized into chapters by theme. Historical background of rail development in the country is provided, as well as general surveys of the northern and southern rail nets. Specific lines of critical importance, such as the Baltimore & Ohio, are singled out for more detailed treatment. Materially, everything is covered from equipment (e.g. engines, tenders, rolling stock) to the bridges, stations, and roundhouses essential to their operation. The destruction visited upon the tracks, equipment, and supporting structures is another prominent theme and image source. The reader is finally left with the Lincoln funeral train. Railroads of the Civil War should have points of interest for many readers, regardless of knowledge base. * Enacting History edited by Scott Magelssen and Rhona Justice-Malloy (U of Ala Pr, 2011). The editors of this essay collection argue, with the typical misgivings, for the importance of "historical performances" (i.e. "living history museums, battle reenactments, pageants, renaissance festivals, and adventure-tourism destinations") in bringing history to the masses.